I’m not decorating for Christmas. Well, that is not entirely true. I did put up a tree. And thanks to my daughter, Amy, I have a beautiful Christmas wreath, mantel and door decorations. But this year, I decided that I would stop there and not put out the nativity scenes, Santas, snowmen, nutcrackers and other assorted decorations that I have collected over the years. On Sunday, my husband, Tony, dutifully went up to the attic and pulled all the Christmas boxes down. I put up the tree and decorated it, all the while thinking that it was one big chore. It used to be fun when I had kids at home. We would turn up the Christmas carols full blast and get caught up in the spirit and magic of Christmas. But the kids are now grown and on their own. They have their own homes, trees, decorations, and traditions. And that’s a GOOD thing! I mentioned to Tony that decorating the tree wasn’t fun anymore since the kids were gone. Being the good guy that he is, he said, “I will help you. “ Uh, no. Tony’s contribution to the decorations has always been to make sure the tree was perfectly level (Did I mention he’s an engineer?) and to hang the outside lights. I couldn’t imagine he would relish spending time hanging tiny, fragile ornaments on a tree or that I would be able to let him do it the wrong – his way. After assembling the tree, I was going to unpack the rest of the decorations, but thought the better of it when I remembered that I had an interior decorator coming the next week to help me with some re-decorating I planned to begin after the holidays. I wanted to leave the house pretty much as it was so that she could see it in its usual “un-Christmas” state. So… I took the remaining decorations and put them in the guest room closet, fully intending to get them out after the decorator came. They are still there. And I don’t miss having them out one bit. So this year, they are staying in the boxes. It’s not that I don’t like Christmas or beautiful decorations. I have friends who spend days decorating their homes for Christmas. They hire professional help to put up the tree. They LOVE everything about the process. And I LOVE going to their beautiful homes and taking it all in. It’s just that decorating for Christmas at this point in my life is not that much fun and not that important to me. I’d rather spend my time doing something else. I think on this side of 50, we need to look at where we spend our time and try to spend it on things that we find enjoyable and meaningful. Lord knows there is enough stuff we HAVE to do everyday that is not particularly fun or meaningful (laundry, cleaning up cat puke & unloading the dishwasher are on my list). It is OK to put aside the things we don’t like that we don’t HAVE to do. So, sometimes being brave is letting go of the things you’ve always done or the way you’ve always done them, or what you think other people expect you to do to make room for something new. Do you have any holiday “must haves” or “must dos” that need to fall by the wayside? Maybe it’s not getting out the good china that has to be hand washed and instead getting some really nice plastic, disposable plates from Party City. Or not making your mom’s creamed onions because no one at your Christmas dinner will eat them anyway. Or putting all your gifts in bags and not spending time wrapping them and crafting beautiful bows. Or maybe it’s the gift exchange among the adults in your family in general. Have you ever wanted to take that money and make a contribution in their honor to a charity? Or if you just LOVE doing all that we associate with Christmas – the cooking, baking, decorating and shopping – think about what other things you can let go of for this the month of December so that you can fully enjoy and embrace all that this season has to offer. Whatever it is, be brave. Try something new. Let go of what doesn’t serve you well anymore. On this side of 50 (or at any time for that matter), it’s OK. I certainly understand the need to make an effort when you have kids in the house. I have 2 grandkids that spent Christmas day with us, so I did the tree, wreath and garland. And it was just enough. Waiting for the day when one of my daughters has a home and hosts us! I get feeling this away around October and I always say I’m not going to decorate and do all the hoopla. But now that I have grandkids, I tend to pick and choose what to do. It isn’t anything like it use to be and I’m okay with that too. Thanks for sharing too your daughter’s beautiful wreaths. I know – if it weren’t for the grandkids, I might not even put up a tree. Glad you liked Amy’s Christmas wreaths! I decorated last year after several years of just doing enough to not be a total Scrooge. But this year, I’ve got enough on my plate that I’m just not sure it’s woth the effort. It used to be fun but situations and circumstances do change. I put a wreath on the door and that’s going to be it. I can SO relate to this – my Christmas is getting pared down more and more. I tell myself I won’t even have a tree, but that doesn’t happen – and the kids still love to come home to some of the trimmings. That being said, it’s minimalist Christmas for us and very few presents – we buy a goat or two on behalf of the great-grandparents, buy something useful for the parents and this year I get to buy something for my first grandbaby – that’s the fun part! When the grandkids start coming it gets more fun. My grandkids helped me decorate my tree today and it was fun. But I don’t decorate like I used to and that’s just fine with me! 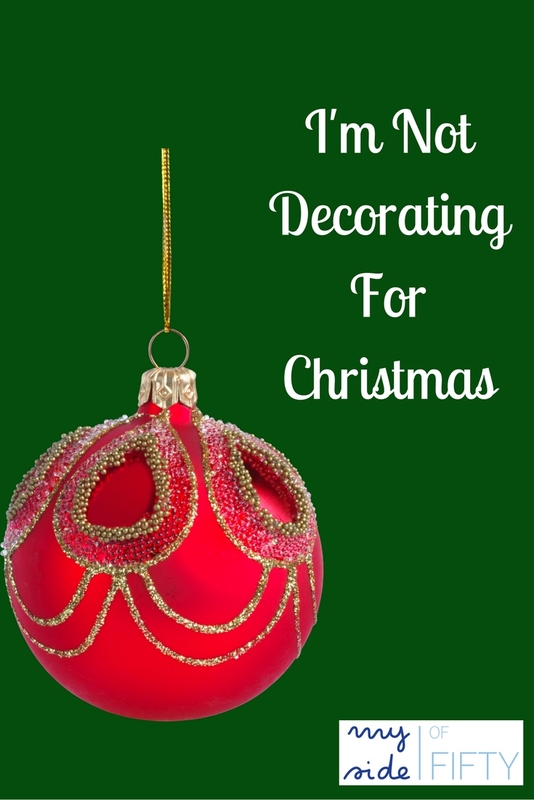 I’ve had many Christmases where I didn’t feel like decorating! Only do it if it brings you JOY! Did the tree with the grandkids today. It was fun to watch them enjoy it! Oh I know just what you’re saying Cathy. My kids always go to Canada for Christmas with their dad so going all out when I can’t see their excitement kinda makes it seem so “blah” . We do put up some decorations just to get us in the festive mood, but that’s about it. Nothing big or over the top though and it makes it so much easier. We can focus on catching up with old friends and enjoy what the season really means. Sounds like a delightful way to spend the holidays! We don’t decorate like we use to either. My kids live out of town so if I do get to see them, it’s if we go there. We have a small tree we put on the breakfast bar to keep away from the furr babies, and that’s about it. I do miss see the grandkids enjoy Christmas, but I don’t enjoy dragging the decorations out just for us. So in the boxing they stay. My grandkids came over to decorate the tree today. If it wasn’t for them, I wouldn’t do it! But it’s fun to do it with them. I agree and don’t enjoy it anymore since the kids are grown. However my grands come and help me and that makes it fun. I wouldn’t do it if they didn’t come and help believe me as I don’t do things now that no longer bring me JOY! That’s exactly what happened today. My grandchildren came and helped me put up the tree. It was fun! Thank you for this post. I, too, decided not to decorate this year. Oh, I’ll decorate the mantel and hang some wreaths. But no tree this year. I agree that it’s become more of a chore than a joy. If something isn’t fun anymore, why continue to do it if you don’t have to? Merry Christmas and happy holidays to all. Got the tree up today – my granchildren helped. My daughter did the mantle & hung the wreath. I’m done! Yes, one of the decorations I’ll always put up is one of Amy’s wreaths. I love them! I haven’t even started decorating yet and all of my neighbors have already finished their decorating. It’s been nice to ride down our street and see all of the lights sparkling already. Perhaps I’ll get started this week. Your post inspired me to decorate in moderation, but to do something. Katy – I was surprised at the number of people in my neighborhood had their decorations up BEFORE Thanksgiving this year! We’ll put a tree up for the grandkids this weekend, but that’s about it! It is liberating and healthy to let go of doing activities that no longer bring you joy. And yes, it provides an opportunity to use that time in a new and more fulfilling way. I happen to look forward to decorating for Christmas, if only for myself, and enjoy the process. I find it relaxing and then love sitting back with a cup of coffee and taking it all in. A lit fireplace and some contemporary, bluesy holiday music completes the experience. 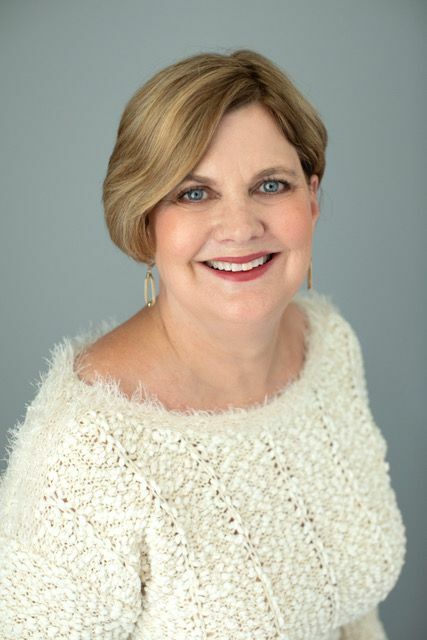 Linda – so glad you like decorating and taking the time to enjoy it! This is my first year to “Not Decorate” since I am anxiously awaiting the call from my daughter that I should head to Houston for the arrival of baby Walker! It’s been so freeing to only decorate a little! A little here and there! Wherever I feel like i’t s necessary! I am the queen of decorating for Christmas and have had a party for too many years to count! NOT THIS YEAR!!! YAYYYYYY!!! What a great reason NOT to decorate! I live in Houston. My daughter in Austin is having her first baby in February. Can’t wait for that call! Marilyn – how exciting! I’m honored to be featured on #OvertheMoon! Best link party around! My husband loves the whole Christmas scene. Some years I really don’t want a tree but would love to decorate other ways. But I like to give him what he wants at the holidays; he deserves it! Easy thing to do if that makes your husband happy! Mine likes for me to make these 2 special kinds of cookies that his mom used to make, so that’s what I do for him. I don’t like decorating for Christmas. Oh, I like it when it is up, but don’t like doing it. I m struggling with Christmas this year. I have to put my cat down this week and just found out my father has terminal cancer. Maybe a tree will give me a bit of holiday spirit. I agree though, that we don’t have to keep all the old traditions every year. Michelle – I am so sorry you had to put your cat down and the news about your dad. That sure puts a damper on the holiday spirit. I’m like you – I enjoy the decorations once their up. It’s the putting them up & taking them down that I don’t much care for! Take care of yourself & thanks for reading and commenting. I like a few decorations, and I put some lovely lights on the balcony. I notice in our shops that the mall will put up decorations but the smaller shops and banks don’t anymore, are they afraid of upsetting some customer who does not celebrate Christmas? I don’t see as many houses in the neighborhood putting up decorations, that is why I put my lights outside, just to say I still celebrate Christmas. I was just thinking about Christmas and how we overdo it with all the decorations. Sometimes less is more for sure. Seems I don’t mind putting it up and it all looks nice but the taking it all down and putting away is where I get stuck. I’m subscribed to your blog since you’re a grandmother. All of us grandmothers have to stick together you know. Drop by our Blogging Grandmothers Link Party, we’d love to have you join us! Last year I stopped hosting Christmas Eve dinner with the whole entire family. We also hosted Christmas breakfast and dinner on Christmas day and all the hosting was just too much. I took a break last year and refused to host anything; it was amazing how much more I enjoyed the holidays! Wow – that sounds like a lot! Glad you got a break and enjoyed your holidays! This year I found myself thinking “Who will keep all these things when I’m gone?”. I felt sad because some of the ornaments for the tree are 70+ years old and I can’t believe we still have them. But I think it’s time to start donating decor knick knacks if my grown children don’t want them now. Cindi – so glad you found my post! Just because all the decorating isn’t our thing, doesn’t mean we are grinches! I can totally relate to this Cathy!! We did decorate this year because it brings my husband joy. But when we used to travel to NY to visit Rob’s family, we didn’t!! 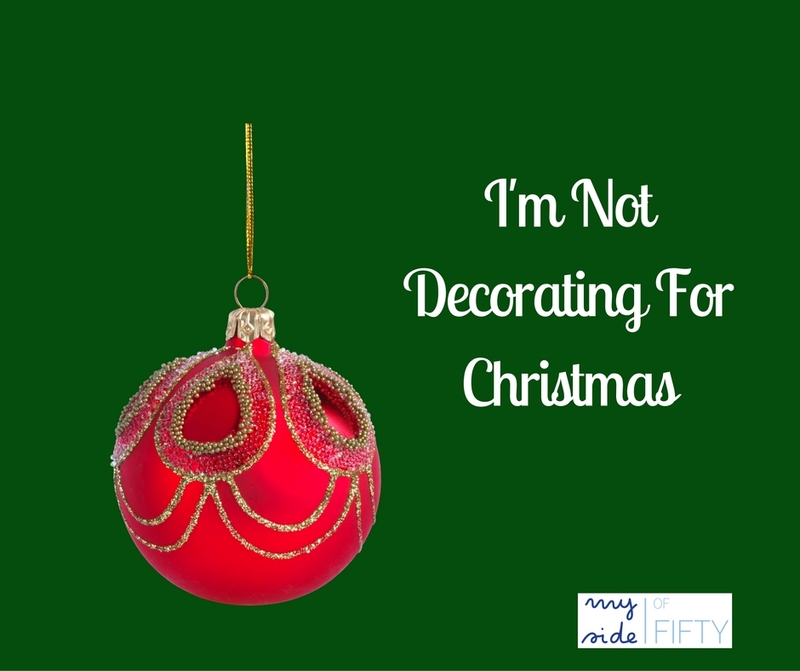 My husband is the same way – he loves it when I decorate for Christmas. And since we have 2 of our 3 grandkids living with us this season, he went all out on the outside of the house and they are thrilled!